Zodiac is one of those brands that disappeared for awhile, and now they’ve been back with a vengeance. Sure, they’re owned by Fossil now, but they’ve got a deep catalog to pull from, since vintage reissues seem to be where it’s at these days (works for the car companies, why not watches?) The most recent watch from them – just announced at BaselWorld – is the Zodiac Aerospace GMT. The Zodiac Aerospace GMT is a watch design that first leapt off the page in 1966, coming from the popularity of the Super Sea Wolf. This is most evident in the design of the dial and bezel. The blocky handset and indices scream 1960s to me, and I dig that the same style was carried over to the GMT hand. A further continuation of the original design is in the 24-hour bezel. On one of the variants, it’s in black and grey, just like the original. This, of course, gives you the day/night transition. But what fun is a reissue if you don’t play around with it some? 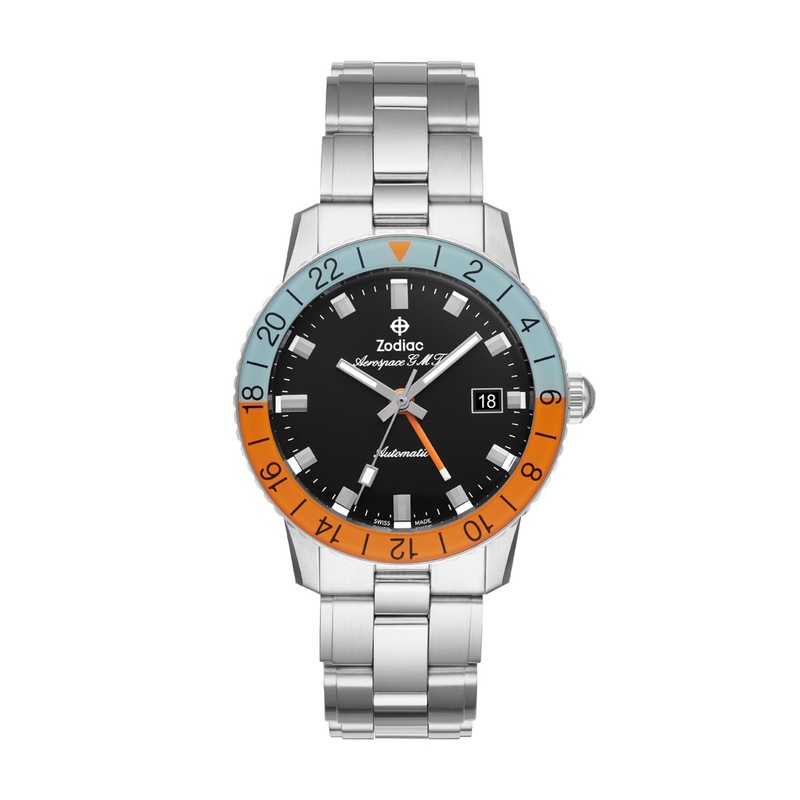 That’s where the second variant of the Zodiac Aerospace GMT comes in, with a light blue and bright orange bezel bringing a welcome splash of color to the design. This is the one that catches the eye, and brings – along with the color – some feeling of a more relaxed nature. I also think it’ll lend itself quite nicely to strap changes if you want a change of pace from the included bracelet. With 20mm lugs, your options are all but endless. What I’d change: Hard to make suggestions here, since it’s based off the original (a homage, you might say). Maybe a lighter-colored dial as well?